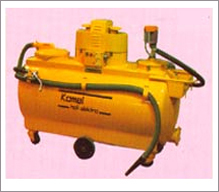 It extracts coolant, chips and swarf from sumps and settling tanks: filters the coolant; returns clean coolant; all in one continuous operation - 50 gallons in ten minutes,start to finish, on sumps regularly cleaned.Under controlled conditions it can also extract from one machine and deliver to another cutting time still more. It never overflows. We are the pioneers to introduce Automatic Wet & Dry Scrubbing machine to Indian market. 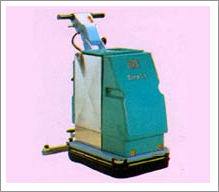 The Automatic Scrubber â€œHafi 43 CT/50 CTâ€� stand as a necessary instrument to achieve results, both in maintenance and in cleaning on all hard floors of factories, public institutions, hospitals, schools etc., Hafi Scrubbing machine has been designed especially to clean wide spaces where both large S.S. Tank capacity & light weight are required. The electronic drive control gives it all the advantages of a large floor scrubber, in spite of the low cost of this machine. Cleaning of floors is a very costly and labour intensive exercise when applying conventional methods like broom and bucket. With Hafi, integrated floor cleaner you can wet scrub, vacuum and dry all waterproof and solid sprung floor, in one single action as well as polish and spray buff quickly, quietly and effortlessly. APPLICATION : The Automatic Wet & Dry Scrubber stands for maintenance & Cleaning on all types of floor for Factories, Hotels, Hospitals, Schools etc. 4. BRUSHES COUNTER ROTATING 2 NOS.Â Â Â 2 NOS.